Flu is a killer every year, and with this season’s high toll of deaths and hospitalizations, the Centers for Disease Control and Prevention has strongly advised everyone older than six months to get the flu vaccine. Even healthy people are at risk, but those with heart failure should take particular note of today’s news. “It is well known that influenza infection is associated with increased risk for mortality in heart failure patients,” said Dr. Hidekatsu Fukuta, the lead author of the new study, a cardiologist at Nagoya City University Graduate School of Medical Sciences in Japan. Fukuta lead a study that looked at people with heart failure who had received the flu vaccine. In the study, set to be presented at the American College of Cardiology meeting, the heart failure patients who received the flu vaccine in any given year showed a 50 percent decrease in risk of death during flu season, as well as a 20 percent decrease for the rest of the year. “Given the high mortality rate and the relatively low influenza vaccination rates in heart failure patients worldwide, our study supports a wider use of influenza vaccination in heart failure patients,” said Fukuta. A nurse prepares a flu shot at the Salvation Army in Atlanta, Feb. 7, 2018. About 6.5 million Americans live with heart failure, which means their hearts aren’t strong enough to effectively pump blood through their bodies. And they may be more susceptible to complications from the flu, including pneumonia, and of course, the stress on their body from the flu could worsen their heart problems. The Heart Failure Society of America recommends annual influenza vaccination, but guidelines from the American College of Cardiology, the American Heart Association and the European Society of Cardiology don’t make specific mention of heart failure patients. This study, an analysis of six past works on heart failure and flu that included more than 78,000 patients, found that the proportion of heart failure patients who had gotten the flu vaccine ranged from 26 percent to 86 percent. Though this study focused more specifically on heart failure, 41 percent of adults hospitalized with the flu during the 2015-2016 flu season had heart disease. Heart disease includes heart failure, as well as coronary artery disease, hypertensive heart disease, pulmonary heart disease, heart valve disorders, arrhythmias including atrial fibrillation and congenital heart defects. Researchers did caution that while the observational studies they used to collect the data mean that getting a flu vaccine is associated with fewer deaths, it doesn’t necessarily prove cause and effect the way a randomized controlled study would. Because Fukata’s study will be presented at a cardiology meeting, it hasn’t yet been through the rigorous peer review that’s required to get new medical research published in a medical journal and the study itself hasn’t been released. 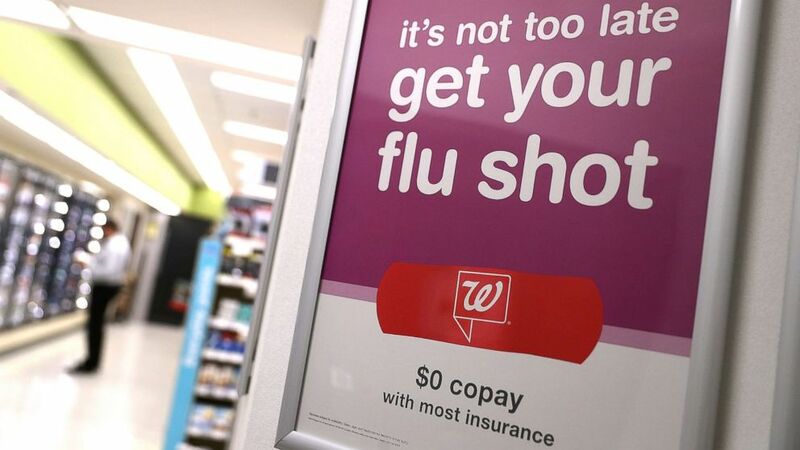 But Fukuta says that this may give heart failure patients an extra, and new, motivation to get the flu shot, which is widely available and inexpensive. Jay-Sheree Allen, M.D. is a resident in the ABC News Medical Unit.